Glad it arrived safe. Yes it is YELLOW isn't it. Unfortunately I'm always in the hands of the supplier and the images on their website. I've never had that colour before so it was a bit pot luck. As for the 'feet' they are actually on the top side of the part and are just there to stop curl during the printing. Just cut them off with a sharp knife. Why doesn't that pile of parts look like a printer yet????? Hah, don't worry Andy, my 3.5 year old LOVES the yellow! She's already requested that I print an aeroplane, a monkey, a kookaburra and a whale for her. Sure, it's probably not the yellow I would have chosen, but it's still cool. I'm happy. Figured the "feet" were removable too after looking at your Thingiverse pics and noticing a distinct lack of them in the finished printers. I think your BOM is only missing that a few self-tapping screws are required in a couple of places, unless I'm mistaken? No idea how many but on the carriages (not sure if that's their real name?) there's a few at least. Don't worry vreihen, they won't be a pile for long! Just need to find a job first (lol, was made redundant on the Friday of the week I ordered my parts! Terrible timing!) but once the electronics get here, everything will go together quickly. The translated tracking on my electronics says "airlines" so they can't be too far off now that they're out of China. That's very possible. They were designed for the Bosch/Rexroth compatible extrusion that I use from KJN in the UK. Could someone run through the settings for cura so I can get my cherry pi lll to print.What printer do I pick on the wizard etc.I have done it once already and the current print job will goto about 50% then the filament feeder starts going backwards then forwards and messes the print up. Fortunately it's only by a mm or two, so it doesn't take too much effort (although my opinion may change by the time I get through all 61 of them haha). Just something for people to be aware of if they're using OpenBuilds V slot! Edited 1 time(s). Last edit at 09/18/2014 09:15PM by pugzor. I used OpenBuild V-slot too, and for me it was more than a few mm. I was using 10-32 hardware, so that might affect things a bit. But I couldn't even fit the nut and washer in the slot, much less the plastic part too. I wound up redesigning the t-nuts to fit some small-profile 10-32 nuts. Not the best design, but I superglued each one in and they are pretty sturdy. Edit: Here's the nuts I designed. In case it proves helpful for anyone. Edited 1 time(s). Last edit at 09/18/2014 10:44PM by maso. Hey maso... Did you also encounter the issue that OpenBuilds V Slot is not compatible with the carriage design? I'm finding that there's a fair bit of a gap between the mini V wheels and the extrusion. Along the lines of 3-4mm total (probably about 2mm each side?). Obviously this means there's a lot of play. I did find that I had to tighten those carriages down quite a bit. Come to think of it, I had to shave some plastic out of the slot in one of them so that I could get it tight enough. But it really wasn't too bad. And the printer is working swell now. Maybe one of us should try to make a carriage that has the wheels closer together sometime. Honestly, mine are far enough apart that I will have to design another wheel section of the carriage. I've just dry attached the wheels and it's enough that if I put the two wheels on the same side into the V slot, the bottom of the wheel on the other side is flush with the outer surface of the extrusion. Hmm, now I need to find a local printer who'll produce it for me. You can clearly see the difference in the 'V' between the two types, hence the poor fit on V slot with it's much deeper V.
I've modified the carriage .stl and attached it above. 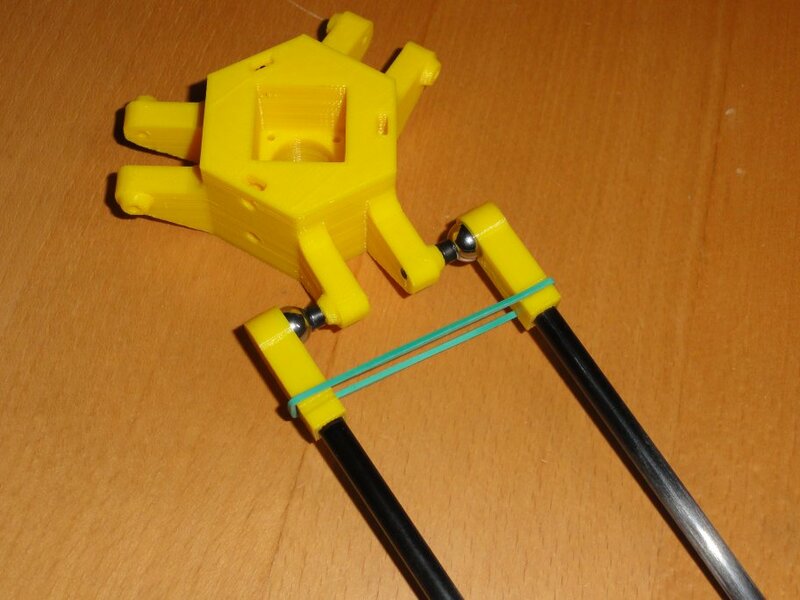 You will also need to use the modified Rod Carrier, also attached. You won't need the new rod carriers Andrew. Your set are the newer type. I altered them a while ago in order to allow more adjustment to the tensioning screw. Basically I moved the fixing points to the carriage around. I moved the V wheel mounting holes on the carriage 1mm towards the centre on either side. 2mm closer overall. This seems fine on the small piece of V slot I have. Hmm. Even with the tensioning screw done up fully, there's still around 1-2mm of play between the V slot and one of the wheels (assuming the other wheels are fully in the V slot). That's for me anyway. I've attached my original Sketchup file for the V wheel carriage. Amend it to suit your needs. Hey Andy, pretty confident the carriages you sent me were the old design; it'd definitely explain the poor fit for me! I also compared to the sketchup you just posted. In the file, A is ~5.2mm but the piece I've got is ~4.0mm. In the file, B is ~2.4mm but the piece I've got is ~3.3mm. That's all the issue is, I think! Stray from the BoM, pay the consequences! Haha. Lesson learnt. Out of interest Andy, what settings do you use to generate your carriages? As in, what % fill etc so that you got a good amount of flex for adjustment? Additional question edited in: Did anyone secure the micro switches in with a touch of CA? Yes, I'm clearly a novice at this, just want to stuff as little up as possible. Screwing things up is inevitable, minimizing the screw ups is a choice! Also Andy, I know you've stressed that the arms need to be exactly the same length... but what's the tolerance you'd think is acceptable? I think I've got less than 1mm difference between the longest and shortest of my arms with the ball ends on... is that close enough? Or should I be shaving them until I can't distinguish a shortest and longest arm? Another edit; now with pics of aforementioned arms! Edited 2 time(s). Last edit at 09/22/2014 06:36PM by pugzor. I use 0.3mm layer height and 33% in fill on virtually all my printed parts. The effector, which is the only ABS part, I print at 0.2mm layer height. I use a drop of high viscosity CA to fix the limit switches. It's easy to pop them out if they ever fail but they are secure for normal use. Just don't use too much. I apply it with a wooden cocktail stick/tooth pick. The rods need to be as close to equal as possible. Certainly within 0.1mm. A 1mm differential is probably too much. Thanks for that! Looks like I've got a bit of adjusting to do then. Thanks for the updates to the carriages! I was looking at the V-Wheel carriage design, both the OpenBuild .stl and the original .skp file, and had a question. I was wondering what you use to tighten the carriage down onto the v-slot? The earlier design from Thingiverse has a place for a captive nut, but i just see a shallow slot in these new ones. Does that serve a purpose? Or are you just tapping the plastic and relying on the strength of the threads in the plastic there? Hey maso, I found that the M3 30mm SHCS held fine and were great for the adjuster screws to clamp the wheels onto the V slot. Obviously I haven't been able to actually clamp onto the V slot yet but it seems great for tapping the thread by itself. I use an M3 25mm bolt to clamp the carriage. The hole is sized to ensure the M3 self taps. They hold great. The slot is to accept the stainless steel wire that is used to anchor the spring and Spectra line to the rod carrier. It just enables the rod carrier to sit flush on the face of the carriage. Woo hoo, I picked up my replacement carriages yesterday. That couple of mm makes soooo much difference; they fit perfect on the V slot. Edited 1 time(s). Last edit at 10/03/2014 01:36AM by ekaggrat. IMO, the actual setup is better. So I don't know if it's helpful for anyone else or not, but I modified the original V-Wheel carriages to fit OpenBuild extrusions. I don't have time or resources at the moment to move to the string-and-spring approach, so these carriages have the hole pattern that fits the original magnetic design. I installed them on my printer last night, and now that I don't have to crank the carriages down, everything is much more square!